This compilation is not to be mixed up with The Essential which was released almost at the same time but contains completely different material. The Essential Collection is a double CD which front cover layout slightly reminds of the albums Mars Polaris (1999) or Zeit (1972), using the same typeface as the latter, and indeed it contains the title track of that album. 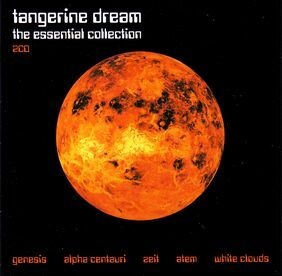 On the backside of this compilation is printed: "Tangerine Dream are the German avant-garde progressive masters who bridge the gap between atmospheric space rock and electronic dance. In the course of a three decade career they have proved themselves to be the definitive art rock pioneers. This 2cd set brings together the highlights from the band's 10 most important album releases." At least the last sentence of course is completely marketing rubbish: The releasing company just once more bought material from the 'Pink' and 'Blue Years' eras to form just another 'essential' compilation similar to The Best Of Tangerine Dream, From Dawn 'til Dusk, The Story Of Tangerine Dream, Atmospherics, The Pink Years/The Blue Years, Journey Through A Burning Brain and An Introduction To..... At least, the material from the two eras is split on the discs, making the first one a collection of 'The Blue Years', while the second one compiles music from 'The Pink Years'. The tracks on each disc are arranged almost chronologically, making this compilation more senseful and enjoyable than some of those mentioned above. The 8-page booklet includes a large b/w photo of the line-up Edgar Froese/Chris Franke/Peter Baumann and a 3-page band biography by Mark Crampton which does not tell anything new but is in most parts quite informative and accurate (with a few errors regarding the years of changes of the TD line-ups) and not limited to the years featured on this compilation. The tracklist inside the booklet is correct for the most part, listing the tracks with the years of original release and their composers, but it wrongly credits Johannes Schmoelling instead of Steve Schroyder for Alpha Centauri, and it does not mention the original albums the tracks were taken from. The record includes tracks from the albums Electronic Meditation (1970), Alpha Centauri (1971), Zeit (1972), Atem (1973), Green Desert (1973, released 1986), Poland (1984), Le Parc (1985), Underwater Sunlight (1986), Tyger (1987) and Livemiles (1988). This compilation contains no new material, so it is not of great interest for TD collectors and fans, but (maybe in combination with the compilation The Essential mentioned above, which would fill the gap between 'The Pink' and 'The Blue Years') this album provides a quite useful introduction into two significant eras of TD, especially as it contains all tracks in their original unabridged length (five of them are near or over the 20 minute mark) which is rather uncommon for these kind of releases and illustrates the progressive character of these compositions.